The Georgia Institute of Technology and Universidad Autonoma de Aguascalientes (UAA), Mexicopublished an article in the journal Environmental Pollution finding that dumping the dispersant Corexit into the Gulf of Mexico increased the toxicity of the mixture up to 52-fold over the oil alone. We’ve previously reported that even small amounts of dispersants are toxic to phytoplankton … the basis of the food chain in the Gulf. We have documented for years that dispersants like corexit increase the toxicity to humans, animals and fish. For example, toxicologists noted in 2010 that corexit “ruptures red blood cells, causes internal bleeding”, “allows crude oil to penetrate “into the cells” and “every organ system”. Scientists note that dispersants release much higher levels of cancer-causing polycyclic aromatic hydrocarbons than oil alone. Dispersants also cause gulf fish to absorb more toxins and then make it harder for the fish to get rid of the pollutants once exposed. 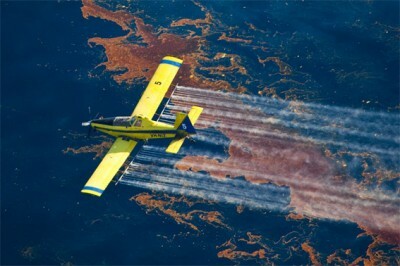 We’ve also previously noted that dispersants make oil last longer, because they slow the growth of oil-eating microbes. (and see this). Dispersants also prevent collection of oil, as they break up oil slicks into tiny globules that cannot be harvested using clean up booms. Now scientists have warned that they may have simply made toxic components of the crude more mobile, allowing them to further penetrate beach sediments and leak back into the water where they could harm marine life. Researchers from Utrecht University in the Netherlands and Florida State University examined the effects of the Corexit 9500A, a chemical dispersant BP pumped into surface waters and at the wellhead in response to the spill. In a study detailed in the open-access journal PLoS ONE, they used laboratory-column experiments to simulate the movement of dispersed and non-dispersed oil through seawater-saturated beach sand. They found that using Corexit 9500A has the unexpected effect of allowing potentially harmful crude oil components called polycyclic aromatic hydrocarbons (PAHs) to penetrate deeper and faster into the sands. Once there the lack of oxygen may slow the degradation of the PHAs, extending their lifespan. Even worse, the researchers warned, using such dispersants in oil spills near to the shore could allow these chemicals to penetrate sands deeply enough to threaten groundwater supplies. And it coated the sand grains themselves, making them less able to hold on to the oil. This meant that as waves from the gulf repeatedly flushed contaminated beaches, PAHs were pumped deeper and deeper into the sediment when dispersant was present. It also meant that the flushing effect of the tides on an oil contaminated beach could allow the release of PHA’s from the sand back into the water. Indeed, it was known even before the Gulf oil spill that dispersants such as Corexit make everything worse. And now even BP-funded scientists say that using Corexit in the Gulf made the oil spill worse. So why was Corexit used? Because it temporarily hid the amount of oil in the Gulf … so that BP could pay lower fines (which are calculated based on the amount of oil spilled) and pretend – for p.r. purposes – that the spill wasn’t very bad. That’s why oil companies will keep on using dispersants on spills: to try to temporarily hide the oil.